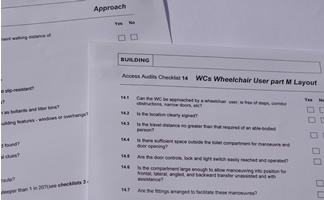 Access Appraisals / Audits are the first stage in the design process and ensure that the best possible design for a new development is encompassed in the scheme both for disabled people, older people and people with buggies. Reviewing the design using our access experience and broad knowledge of the development process produce clear thinking on the access approach, and development justification for the design detail as the scheme develops. Cowbridge Design's specialist knowledge of the issues surrounding disabled people can save money and increase potential income. Our design philosophy will improve customer and staff satisfaction and loyalty. We provide property access solutions, which help meet your responsibilities under the old DDA and new Equality Act. The Equality Act has the stated aim to 'harmonise discrimination law, and to strengthen the law to support progress on equality'. The Act replaces all existing equality legislation, including the Disability Discrimination Act (DDA). The Equality Act aims to ensure that service providers and businesses' will have to consider how their policies, programmes and service delivery will affect people with the protected characteristics such as age, gender and / or disability.